1.) 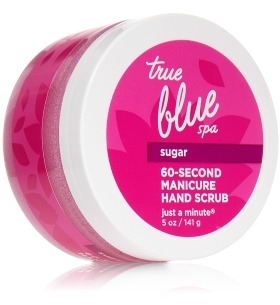 60-Second Manicure Hand Scrub by True Blue Spa, Bath & Body Works, $12. I cannot praise this stuff enough. If I had to choose 1 product out of all of these you must buy, this would be it. It's available in B&BWorks stores as well as online, and fully worth the price. This is one of my newest obsessions and take it with me whenever I travel. (I'm going slightly out of order here, I apologize.) After you've removed your previous manicure with #2 or #3, wash your hands thoroughly with this stuff. As you can see from the title, it's best to keep massaging this into your hands for at least 60 seconds. It is the consistency of a sugar-scrub, but after you work it into your hands for at least 60 seconds, it turns into a lotion-like consistency. I keep working it into my hands until all the (crystals) are dissolved and I'm left with a thick lotion all over my hands. It's important to pay special care to your cuticles and nail beds. When you rinse your hands, you'll be amazed. They're so soft! By the way, you're welcome. As you can see by the photo, I only have a small container of this, a sample size actually. I really love this stuff, but I don't think it's worth the price tag for the amount of nail polish remover that I go through. I go with Target brand (#3) due to the sheer volume of remover I go through. I received the Zoya remover for free when I ordered from them awhile ago and only recently tried it. Zoya describes it as an "award wining, gentle, yet highly effective 3-in-1 nail polish remover, nail prep and nail conditioner", which does make it worth the extra cost. The small 2oz. size that is in my picture above will cost you $4.60 plus shipping. If you don't do your nails very often, it may be worth the cost. It doesn't smell as harsh as regular nail polish, nor does it dry out your nails, cuticles, and fingers while using it. As part of a Christmas FlashCode from Zoya I received the $9.99 8oz. size free, but after I've gone through that I probably won't pay to replace it. I like that it's called 'Delete and Repeat', very appropriate in my case! 4.) 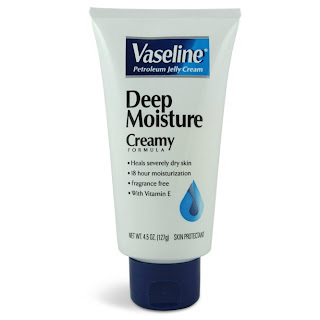 Vaseline Deep Moisture, Target, etc., Under $3. My sister Re hooked me on this stuff and I use it on my hands every night. You only need a little bit and it moisturizes your hands incredibly. It's very reasonably priced too for good lotion. Over the years I've accumulated quite the collection of lotions, haven't you? I now have a massive basket of lotions in my bathroom closet that I don't use use infrequently, and I wish I had half the money I spent on all of it! Although it's a fragrance-free lotion, it does leave a pleasantly light, clean smell that I love. For everyday moisturizing of your hands, you need this stuff! My husband loves it too. Don't tell him I just said that. It actually may be more the hand massage I give him when I put it on the more I think about it. But hey, everyone gets dry skin! 5.) 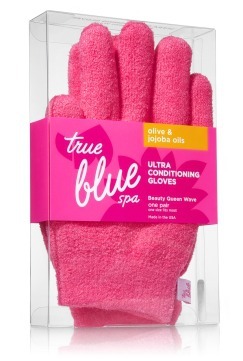 Ultra Conditioning Gloves, by True Blue Spa, Bath & Body Works, $25. These are definitely the most fun thing on the tray! When I was in B&BWorks, I debated on getting these, but then saw the Buy 2, Get 1 Free sign and grabbed them immediately. I'm about 75% glad I did. I don't know if they're worth $25, but they work. Really well. I didn't realize until I got home that they're more than just gloves. I had been looking for a pair of manicure gloves to put on after applying intense moisturizer, and thought these were it. Much to my surprise, they're to be used on their own without adding lotion. You can wear them for 20 minutes for a quick treatment or overnight for a more intense moisturizing treatment. They're a little awkward to get on and off, but feel like a paraffin dip if you've ever experienced one. I made it til about 3am the night I wore them to bed and took them off due to waking up on the warm side. You definitely feel a difference even wearing them for 20 minutes. I think in the future I'll wear them to bed once a week and maybe wear them 2-3 times a week while catching up on DVR. "Formulated with paraffin, olive, avocado and apricot oils plus antioxidant Vitamin E to leave hands as soft as cashmere and lightly fragranced with an addictive blend of sweet Tahitian vanilla, whipped shea and golden amber." This is a thick, creamy lotion that definitely stays on your hands for awhile. 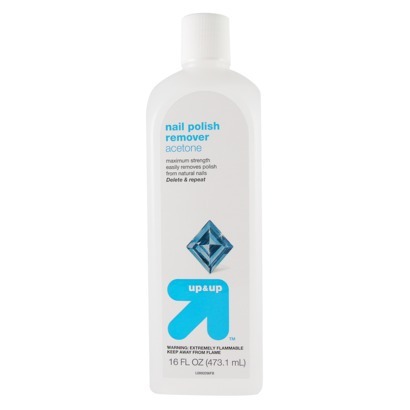 I use this after removing my old manicure and using the 60-Second Manicure Hand Scrub. (#1) My hands are glistening and oily looking for awhile, but they feel amazing! At least pick up the travel size! You can get these anywhere, you know that. I just wanted to point out that I buy the "jumbo" ones for removing my nail polish as I think these work the best. So what are your go-to products to protect and take care of your hands?